The Scottish government will act if football clubs do not take "meaningful action" on unacceptable conduct at matches, Humza Yousaf has said. The justice secretary said options were already being explored by politicians. His tweet came after a weekend in which objects were thrown and smoke bombs were used inside grounds. A cigarette lighter landed near Rangers captain James Tavernier as he took a throw-in during the match at Motherwell. There were also three arrests at Saturday's Edinburgh derby, two for objects thrown from the crowd. Smoke bombs were let off at Tynecastle Stadium during Hibernian's 2-1 win over Hearts, while a coconut was also retrieved from the field of play. Mr Yousaf was responding to former Scotland striker Billy Dodds, who told BBC Sportsound on Sunday: "We want to keep the politicians out of the game, but it's getting to the stage where they are going to act and fans need to realise that. "We want a good atmosphere, but this is dragging Scottish football down." In a tweet quoting Mr Dodds, Mr Yousaf said: "I'm afraid the unacceptable conduct we have seen for many months in the game means that politicians are already involved. "I want clubs to show me what action they will take to kick it out the game, if no meaningful action is taken the govt will act. Options already being explored." He has previously said that the Scottish government could consider using current legislation such as local authority licensing laws or using strict liability for football matches. 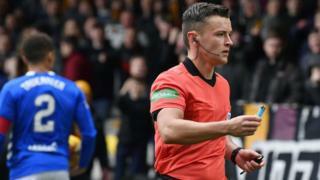 A survey by BBC Sport Scotland found that just three clubs - Partick Thistle and Queen of the South, and Annan Athletic - were in favour of adopting the policy to deal with fan misbehaviour. Ayr United director Mark Pettigrew said clubs were not clear what strict liability would mean, but it could lead to an "exodus from boardrooms across the country" if directors were held personally liable for fan conduct. "In context of where we are economically, it's harrowing," he said. "Clubs are genuinely fearful and strict liability could make things significantly worse and, in extreme cases, put clubs out of business. "As long as clubs are complying with licence conditions and have the correct number of stewards in place, liaise with each other and the police where required, that's all we can realistically do. At the end of the day it comes down to individual supporters to behave." Mr Pettigrew said broader issues also needed to be considered, such as an "apparent decline in behaviour" since the repeal of the Offensive Behaviour at Football Act last year. The Scottish government said that while the vast majority of football supporters were well-behaved, a problem remained. Mr Yousaf added: "The Scottish government will continue to consider what further action we can take, and I will listen to ideas from across the parliamentary chamber, be it strict liability or exploring what can be done within licensing laws - all options remain firmly on the table. "The now repealed Offensive Behaviour at Football Act helped to clarify what behaviour is no longer considered acceptable and, as we and others who gave evidence to the committee warned, removing these legislative powers from police and prosecutors sent entirely the wrong signal to those who shame our national game."